When ordering screen printed apparel, it’s important to keep in mind that the cost of printing goes down as the quantity of shirts goes up. That means that big orders are a lot more cost effective for you. Our minimum order for screen printed apparel is 24 pieces (of each design). Our turnaround time for screen printed orders is 2 weeks + shipping time. This is an estimate, and starts when the order is finalized – all designs must be approved and apparel and sizing chosen. If you have a specific deadline, please advise us as soon as possible. If it is needed with a short turnaround time, rush order fees may apply. Absolutely! As long as you are printing the same design on all of the apparel, you can mix and match the style of shirt. For example, if you are printing a 1 colour design on 24 pieces of apparel you can print on 8 tshirts, 8 tanks and 8 hoodies. The number of colours being printed on your shirt greatly affects the price. If you’re printing a 6 colour image, but can get the same results with just 3 or 4, that will help decrease your final price. The turnaround time on your order with us starts when you’ve paid a 50% deposit and we have all information required to complete your order (all artwork, fonts, shipping info, etc.). Delay in receipt of *any* of this info could result in production delays. Our current turnaround time is 2 weeks + shipping. Complex orders or extras may increase turnaround. Delay in approval of mock ups could also result in production delays. The most up-to-date turnaround time will be listed on your quote. If you have a deadline for your order, it is very important that you let us know when placing your order and a rush fee may apply if there is not enough time to complete your order under normal circumstances. If you do not advise us about a due date until after your order has been paid for and pushed through our system, we may not be able to accommodate your request. Any circumstances out of Southern Screen Print's control (ie: weather delays, shipping errors by the supplier, etc.) may also require more time and are not factored into the initial turnaround time estimate. All files must be 300 DPI or vector format. The design should be sized to the size you would like it to print. Text must be converted to outlines. Printing can only be as good as the artwork. We will not be responsible for poor quality printing due to poor artwork. We're is not responsible for any misspellings, errors, or issues in your art file. We do our best to catch these errors and point them out to you, but we may not catch them all. If it is in your art file and on your approval, that is how we will print it. Southern Screen Prints is not responsible for items that are out of stock. While we check items we know to have potential stock issues, all garments are ordered after your order is placed, and we cannot guarantee their availability. If items are out of stock, we will provide you with a list of possible replacements and get it approved by you before using your chosen item. Although Southern Screen Prints has the latest equipment available, inconsistencies may occur in registration and ink coverage when printing near or over the collar, seams, or any other edges. Any large prints may run the risk of going over the sleeve seam. These are all considered acceptable goods and will not be considered for reprints. Although Southern Screen Prints has the latest equipment available, inconsistencies may occur in registration and ink coverage when printing over the zipper, pockets or any other uneven surfaces. We will not be responsible for these inconsistencies. There is no way to effectively and efficiently measure a distance from the collar on each shirt as each garment is loaded onto the press by hand. 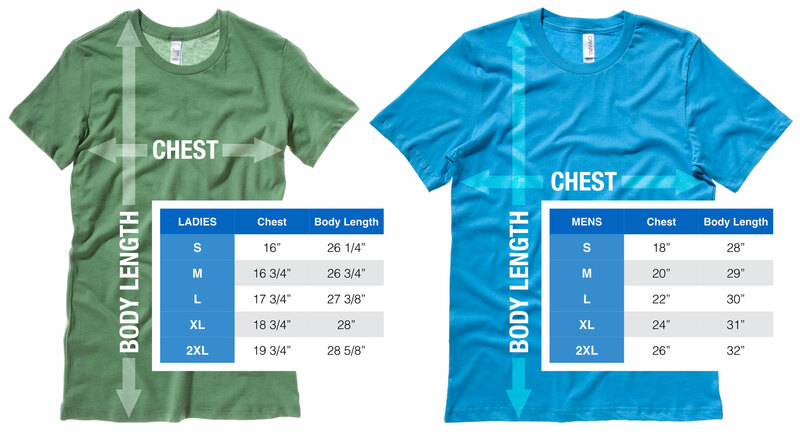 If you request a print that is 2” down from the collar, we will use that as a guide and do our best to make sure that all shirts hit that target, but not all shirts will hit exactly at 2”, they may be off by as much as an inch in either direction. This will not be considered a misprint and Southern Screen Prints will not reprint or refund these shirts. Example: BrandX places an order for 100 Anvil 980 shirts in Black. Southern Screen Prints then orders the shirts to prepare for printing. Two days later, BrandX wants to change the order to now print on 100 Anvil 980 White tees. Southern Screen Prints has to re-write the order and ship the black shirts back to the supplier (paying a 15% restocking fee + shipping costs) then pay to have them ship new shirts out. Example: BrandX places an order for 99 shirts. Southern Screen Prints then orders the shirts to prepare for printing. Two days later, BrandX needs to cancel the order (for any reason). Southern Screen Prints has to return the shirts to the manufacturer, incurring shipping fees and restocking fees. Southern Screen Prints refunds BrandX for their order minus necessary cancellation fees. We cannot be responsible for any shipping delays caused by the shipping company. Due to the nature of this business, We will not be responsible for under-runs or spoilage up to 10% per design (spoilage must be more than 10 shirts per design for a reprint). Please keep this in mind when ordering (it is never a bad idea to order extras). We always do our best to get you what you ordered. We will refund you the cost of any items shorted from your order but will not process a reprint for less than 10% of your order (or 10 shirts minimum). We will not, at any time, be responsible for any lost profits on items shorted from your order. (IE: If you paid $7.50 per shirt to get the shirt printed, but you sell them for $25.00, Southern Screen Prints is only responsible for the $7.50 you would have paid us for the shirt). Southern Screen Prints is not responsible for manufacturer defects such as color inconsistencies, stitching errors, mislabeled garments, loose/inconsistent stitching, and/or garment defects (holes in garments, ripped seams, etc.). We try our hardest to inspect the garments as we print them, but we cannot guarantee each garment. We are not the manufacturers of these garments, so we cannot ensure their construction. We highly recommend ordering 5% extra of each size if an exact count is important. Southern Screen Prints will not be responsible for your satisfaction with the garments printed on or the printed artwork. We are always available to counsel any customer to ensure you pick a garment that matches your needs but we also need you to do your due diligence on the garment choice. If you are unsure of what garment to select, we can gladly order a number of blank samples for you to choose from. The samples will be billed at a per piece rate and shipped without printing. Blank samples will not credit to the cost of your order. We try to check every garment as it comes off of the press, but there are times where some mistakes will make it out the door. It is your responsibility as the customer to check over garments as you receive them. We allow an industry standard 72 hour window from the time you receive the goods to notify us of any issues with the order. Southern Screen Prints will not be responsible for errors with your order if notified after 72 hours of receiving the goods. We also will not be responsible for any lost income, customers, accounts, and/or contracts if defective garments are sent out to your final customer. While we do quality checks on the garments, the final quality assurance check lies in the hands of you, our customer. We go to great lengths to try to ensure that every order that leaves our facility is correct. All of our customers are valued customers, regardless of size, and we want you all to know that. Any order printed differently than the mock-up approved will be granted a reprint of the defective product. All claims must be submitted within 72 hours of date of delivery. Please email sales@southernscreenprints.com to submit your claim. If Printworks is responsible for any errors in your order, we will gladly accept responsibility for the issues and will reprint the shirts printed in error. We do not offer refunds, but will gladly reprint any production errors that exceed the spoilage rate. Example: If you order 100 shirts and you’ve sold 15 but then you discover a print defect and you return only 85 shirts to Southern Screen Prints, we are only responsible for the reprinting of the remaining 85 shirts).